This is definitely something new. 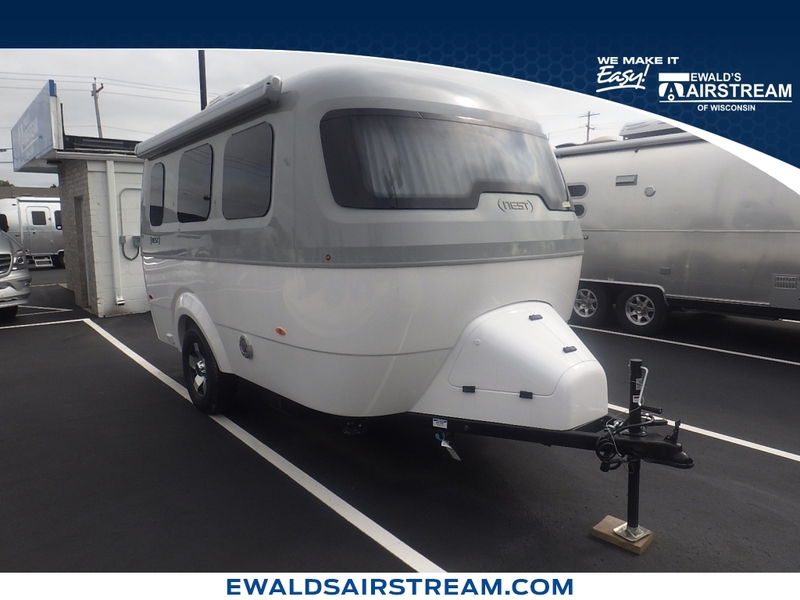 With its fiberglass body and automotive styling, the new Nest by Airstream doesn’t look like anything we’ve made before. But it has the same soul as our iconic aluminum travel trailers – the same careful craftsmanship, and the same spirit of wanderlust. So if you love clever, modern design as much as you love adventure, you might find yourself feeling like Nest™ was made just for you. Nest is compact, lightweight, and easy to tow, so it’s the perfect sidekick for a last-minute weekend getaway. Its smart floorplans pack in a surprising amount of features and amenities. And its sleek, contemporary design elevates any trip to the next level. Ready to go? So is Nest. Nest’s striking fiberglass shell and panoramic front windows are sure to turn heads. And its interior is equally beautiful – a bright, airy space that puts you at ease. Every surface and fabric, every line and curve is thoughtfully considered and precisely rendered to create an inspiring travel experience. A kitchen, dinette, full bathroom, and queen-sized bed, plus a power awning that creates even more living space outside. And that’s just the beginning. The time you spend in your Nest is bound to become one of the best parts of any trip, thanks to its impressive lineup of features. Nest™ packs a long list of amenities into its compact floorplan. A kitchen, full bath, places to charge your phone, and technology to keep you happy. It’s all so you can have the perfect travel experience, wherever your adventures take you. Nest’s well-equipped kitchen features a two-burner cooktop with a cover that creates extra counter space when it’s not in use, plus a microwave, a refrigerator with an icebox, and a generous stainless steel sink. The 3D Laminate galley top lends a touch of modern style. Plus, thoughtful storage and ample cabinet space keep your mealtime essentials well-organized and easily accessible. Nest’s living space is the comfortable retreat you’re looking for. Both floorplans feature seating to enjoy a meal or get some work done, as well as room for two to sleep comfortably. The 16U floorplan features extra counter space and a U-shaped dinette that converts into a comfy bed. In the 16FB floorplan, you’ll find a fixed queen Tuft & Needle adaptive foam mattress, plus a dinette bench with a stowable table top. And in both plans, you’ll find abundant storage everywhere you look. It’s often the thoughtful little touches that make any experience special. And Nest is full of them, from the bedroom to the entryway with Bluetooth®-controlled LED lights, USB ports and 110v outlets throughout, Blackout curtains, Tuft & Needle® adaptive foam mattress (16FB only), Coat and key hooks and custom Nest Entry mat. That gleaming fiberglass exterior is courtesy of a two-tone premium gel coat that’s incredibly durable. The molded fiberglass entry door lets in tons of light through its window – but Oceanair blinds allow for added privacy when you want it. The LED entry handle and entry lights help guide you home after dusk. On nice days, enjoy some bug-free fresh air thanks to the sliding screen door.